I was 16 the first time I visited a Planned Parenthood center. My friends and I found it in the Yellow Pages after seeing their large ad for free pregnancy tests. The women at the center were kind, and they offered nonjudgmental smiles as I explained the reason why I was there, my face hot with embarrassment. When my test results came back positive the nice woman who had given me the test instructions sat me down and asked if I lived at home with my parents and whether I was comfortable giving them the news. She slipped shiny pamphlets into my shaking hands, as she told me about all of the ways I could handle an unplanned pregnancy and where I could go for financial or housing assistance. She even gave me her phone number to call if I needed any support. At the time, I had no idea Planned Parenthood was such a controversial organization. My 16 year-old self, still naive about the politics and religion associated with women and our bodies, had no idea there was a good chance members of my own, very Catholic family may have picketed out front of the building where I was seeking assistance. Oddly enough, it was that same Irish Catholic family who supported me through my unplanned pregnancy. Looking back, there are concrete actions that people in my life did to make one of the most difficult times in my life bearable. If you know someone who is going through an unplanned pregnancy, whether she’s 16 or 36, here’s what to do to help her get through it. 1. Support how she chooses to handle the pregnancy. You may have very strong feelings about what someone should do about her pregnancy but ultimately it is her body, her future, and her decision. The best thing you can do is offer any information you can on her choices (if she needs it), but once her decision has been made MOVE ON. If you do not agree with her decision, continuing to bring up your opinion will only make her feel more isolated during what is already a stressful time. Make peace with her choice and begin supporting her decision. 2. Find a way to be happy for her. Depending on your role in the expectant mother’s life, this may be very easy or very difficult. I can guarantee you that it will be difficult for her to be happy all the time, too. When you are unexpectedly pregnant you are not supposed to be happy — but let her know it’s okay to have some joy. Give her a baby name book, buy an adorable baby outfit, or tell her how much you love that sweet baby smell right after bath time. 3. Make sure her needs are being met. Does she have a supportive home environment or a stable living arrangement? Does she have access to quality prenatal care and know where to find it if she doesn’t? You don’t have to move her into your home but offering a ride to the obstetrician or dropping off groceries may be much needed assistance whether she is financially in need or just needs to know that someone cares. An unplanned pregnancy can be very isolating. Regardless of age she may feel embarrassed and/or no longer feel like she has anything in common with the people around her. Take her to lunch, invite her to tag along with you and your toddler to the park, or just keep in touch often, letting her know you’ll be there when she needs you. 5. Throw a baby shower. Unexpected pregnancies often go uncelebrated but if she’s going through with her pregnancy then there is a new baby coming into this world and giving her a few hours to celebrate that fact can lift her spirits like nothing else. Even a low-key lunch with friends or family works; it doesn’t have to be a huge shower with lots of planning and gifts. 6. Continue offering support after the baby arrives. Treating her to lunch is great but being supportive is not something to check off your list and forget about. Check in as the pregnancy progresses and after the baby comes as well. 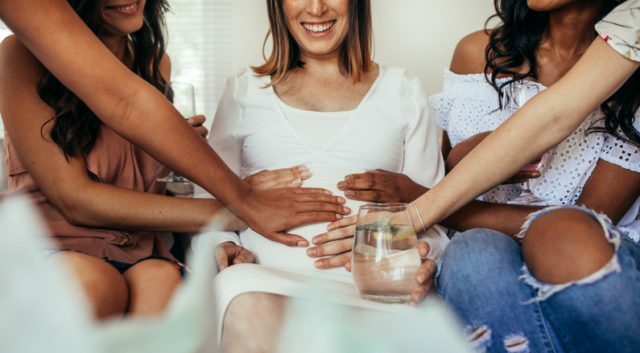 Make sure she’s getting the support she needs after the baby arrives and let her know that she has a shoulder to cry on, as well as a friend to vent to, whenever she needs it.